Olson Irrigation | R.J. Kates Co.
Olson Irrigation consistently provides problem-solving innovations for both agricultural and landscape irrigation applications. A complete line of drip and micro-spray products include Vibra-Clean® Emitters, EH-12® Heads, Ultra-Jets®, O-Jets® and mini-sprinklers. Specialty fittings include E-Z Ell® flexible swing joints and TSR-1 expanding sprinkler risers. The following image shows a GTAW Seam Welder that R.J. Kates maintains and repairs. 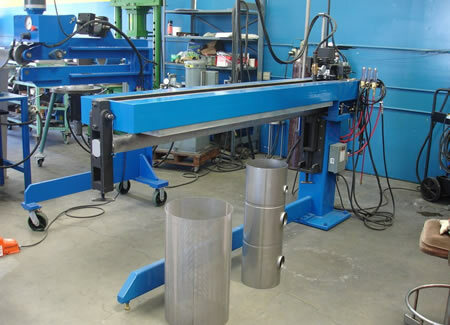 The seamer is used to weld the length of the rolled stainless steel filter bodies together.